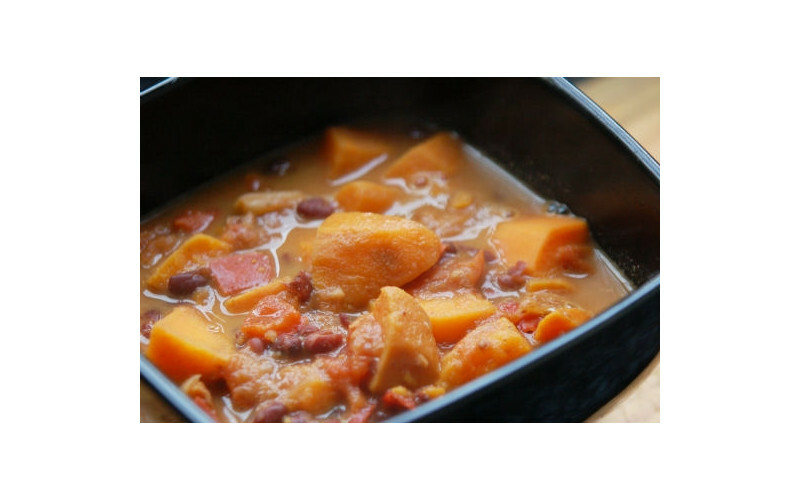 A simple, hearty stew that is full of rich flavour - and with three possible cooking methods! Like all stews, it is even nicer the next day. 1. Sauté onion and garlic in the oil spray for a minute. Cover and cook 5 minutes or until tender, adding a little water if it starts to stick. 2. Place onion mixture in the cooking pan of your choice (slow cooker/pressure cooker/ordinary saucepan). Add the rest of ingredients - up to the chilli powder. Slow cooker: cook on low for 8 hours; pressure cooker: cook for 15-20 minutes on low; saucepan, bring to the boil then cook for 30-40 minutes or until tender. 3. Spoon a ladleful of the cooking liquid into a small bowl. Add the peanut butter and mix well with a whisk or fork until smooth. Add this to the stew. 4. Season with salt and pepper to taste. Top with chopped peanuts and serve with lime wedges -and hot pepper sauce on the side if desired.